Architecture cannot be understood without a strong relationship with human behavior. 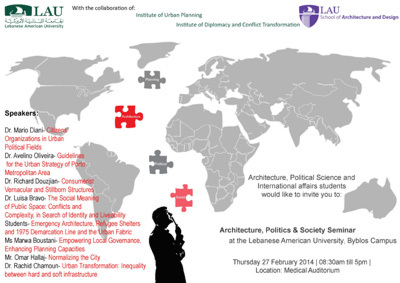 For this reason, the Department of Architecture and Interior Design, in collaboration with the Institute of Urban Planning, Institute of Diplomacy and Conflict Transformation is organizing a seminar entitled “Architecture, Society and Politics”. A wide range of experts in their various fields will be coming together to discuss the overlaps of architecture, society and politics and how they form our world. To see the list of speakers, click here. For the itinerary, click here.